Summary of the project: I spent a month in Brazil developing a campaign to get more schools to volunteer with Habitat for Humanity. Rachael Stephens was lucky enough to be chosen as Glue Isobar’s first T.I.E. candidate. 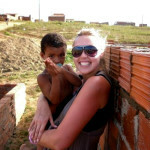 She was placed with the NGO Habitat for Humanity Brasil whose intention is to eliminate all kinds of inadequate housing. They do this through dignified and accessible housing solutions for families of very little income and education, effectively below the poverty line. Rachael’s task was to create a communications campaign targeting private schools to raise awareness of Habitat Brasil and promote participation through volunteering and donations. She was based in the North East of Brazil in the city of Recife, where speaking English is sparse. Days were spent with Habitat and a local advertising agency, Mart Pet, where she learnt a lot about the difference between cultures and the way they approach work. She also lived with a Brazilian family who did not speak a word of English (luckily they were super lovely people!). It was a very successful placement and an extremely rewarding experience for all involved. Click on the case study button to learn more.